We were approached by a couple to transform a tired and dated Victorian property into a contemporary family home for their young family. Works involved an extensive refurbishment and reconfiguration of the existing house with a new contemporary and bespoke rear extension. Inspired by the dual nationality of the couple (British and Australian) the property is designed to have two distinct characters. The existing areas of the house which contain reception, living room and a bedroom retain original Victorian spatial proportions whilst details such as skirting boards and cornicing are reinstated. The new side and rear wrap around extension was conceived as contemporary reading of an Australian veranda structure. It is designed to act as a threshold space between the existing darker areas of the house, garden and sky to create an uplifting open plan kitchen and dining space. Constructed from engineered larch and glass, the space has a very intimate connection with the weather and light. 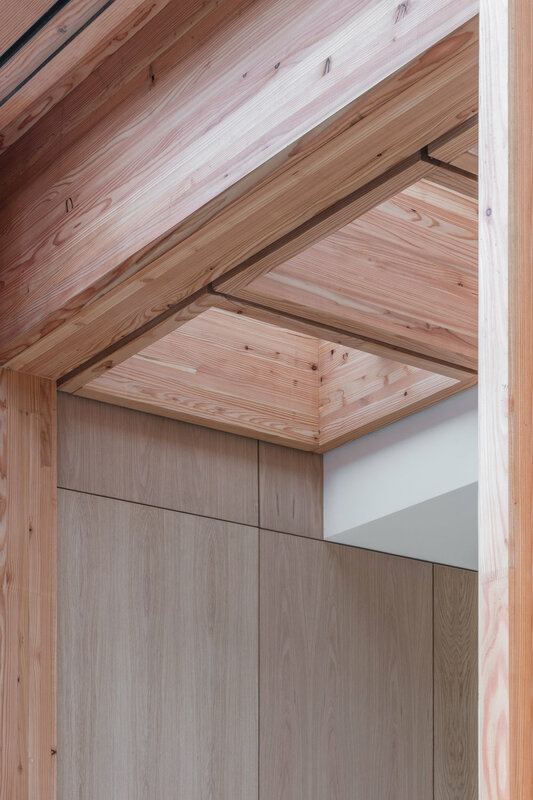 The engineered larch beams are 400mm deep and provide privacy from neighbouring windows whilst adding a rhythm to the space. Key to the structures appearance of lightness all timber sections are 50mm thick including the 3.2m high bifold doors to the rear elevation which add drama and a further openness. As a result of this, the mass of the existing building has the appearance that it is floating within the space. Careful and precise detailing is incorporated throughout to express separate components of the extension.